The most tender and delicious Slow Cooker Pulled Pork Shoulder made with fennel seeds, preserved lemon and fresh herbs. This pork could not be easier to make and tastes incredible. Serve it with olive oil potatoes and veggies or on a focaccia sandwich with homemade salsa verde. Here it comes, our first ever slow cooker recipe and it’s pretty perfect if I do say so myself. 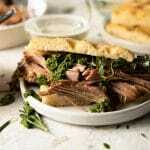 This slow cooker pulled pork shoulder has all the flavours of a classic Italian porchetta but in pulled pork form and it’s seriously to die for! The best thing about it is that it takes about 10 minutes to prepare and then you set it and forget it. Make this in the morning and it’ll be ready for dinner with literally zero effort involved. I chose seasonings that I absolutely love in a classic porchetta, fennel, lemon, oregano, thyme and garlic. The herbs are rubbed all over the pork shoulder with a little olive oil and a generous pinch of salt. It’s really important to season with salt to enhance all the delicious flavours. In Italy, we’d sometimes get preserved lemon in our porchetta sandwiches and they were always my favourite so I added it in here. Be careful though they’re powerful so you just need a little and although you can also use fresh lemon I find it too acidic. Ok, so an IMPORTANT step to making the very best slow cooker pulled pork shoulder is to sear the meat before adding it to the slow cooker. Why? because searing locks in a ton of delicious flavour and created the most delicious crust on the outside. The slow cooker will give you the most beautiful and tender meat on the inside but you really need to sear it on a skillet or frying pan for the best results and it only takes 5 minutes. If your pork shoulder has the fatty skin on make sure to remove it first. 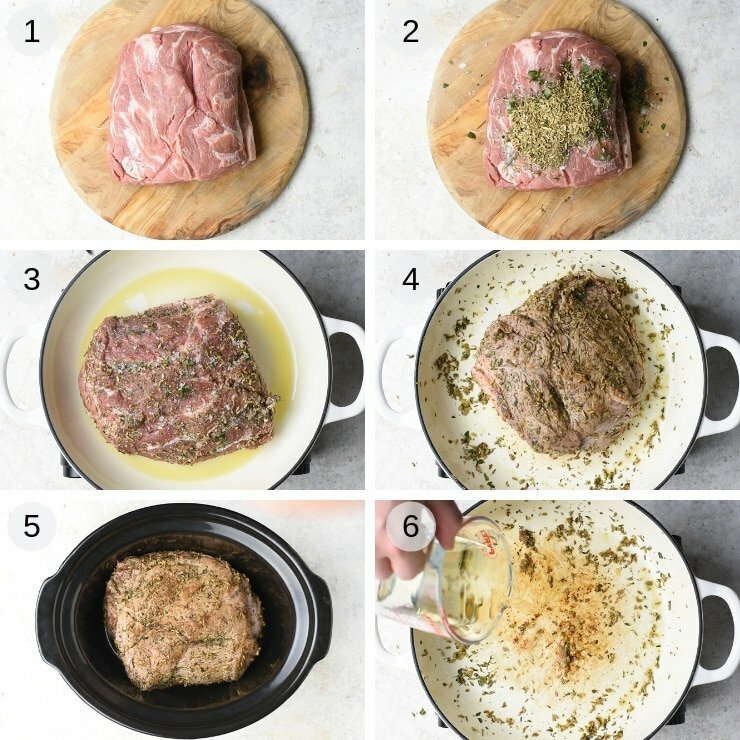 Rub all the herbs and salt all over the pork shoulder on all sides (photo 1 & 2). Heat the olive oil in a large skillet or frying pan on a high/medium heat. Brown the pork on all sides (roughly 30 seconds each side). Add it to the slow cooker (photos 3 – 5). Add the wine to the pan to deglaze and scrape any brown bits with a wooden spoon then pour it over the pork in the slow cooker. You won’t need to cook the wine for more than 1 minute in the pan. Add the peeled, whole garlic cloves to the slow cooker, cover and set on high for 10 hours (photos 6-8). After 10 hours, turn the slow cooker off remove the pork to a cutting board and shred with two forks. Serve with sides of choice or in sandwiches. 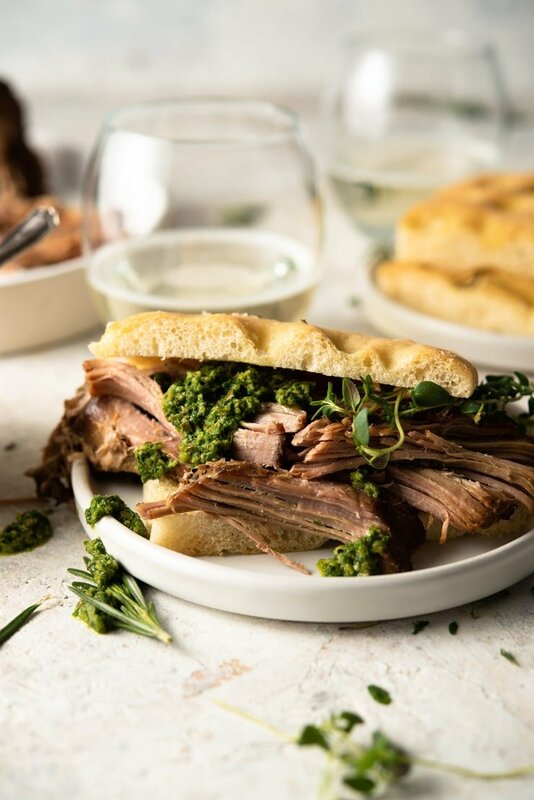 I love to serve this pulled pork on sandwiches made with homemade rosemary focaccia and salsa verde it’s super simple but one of the best things you’ll ever eat. Another great way to serve this is with roasted potatoes, grilled veggies or with a fresh salad. You can easily adapt this recipe with your favorite herbs and spices. Don’t skip the searing of the meat as it locks in a lot of flavour. 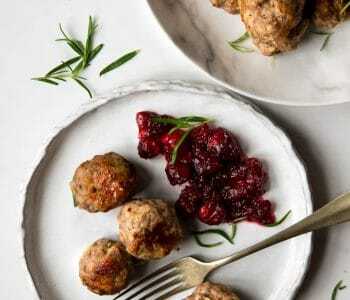 Leftover meat can be stored in the fridge or freezer. If freezing I recommend shredding it first. If you don’t want to use wine (although it gives the best flavour) you can use stock. If you’ve tried this Slow Cooker Pulled Pork Shoulder or any other recipe on the blog please let me know how you got on in the comments below, I love hearing from you! You can also FOLLOW MEon FACEBOOK, INSTAGRAM and PINTEREST to see more delicious food and what I’m getting up to. If your pork shoulder has the fatty skin on make sure to remove it first. Rub all the herbs and salt all over the pork shoulder on all sides. Heat the olive oil in a large skillet or frying pan on a high/medium heat. Brown the pork on all sides (roughly 30 seconds each side). Add it to the slow cooker. Add the peeled, whole garlic cloves and chilli flakes to the slow cooker, cover and set on high for 10 hours. After 10 hours, turn the slow cooker off remove the pork to a cutting board and shred with two forks. Serve with sides of choice or in sandwiches. *see serving suggestions in notes. 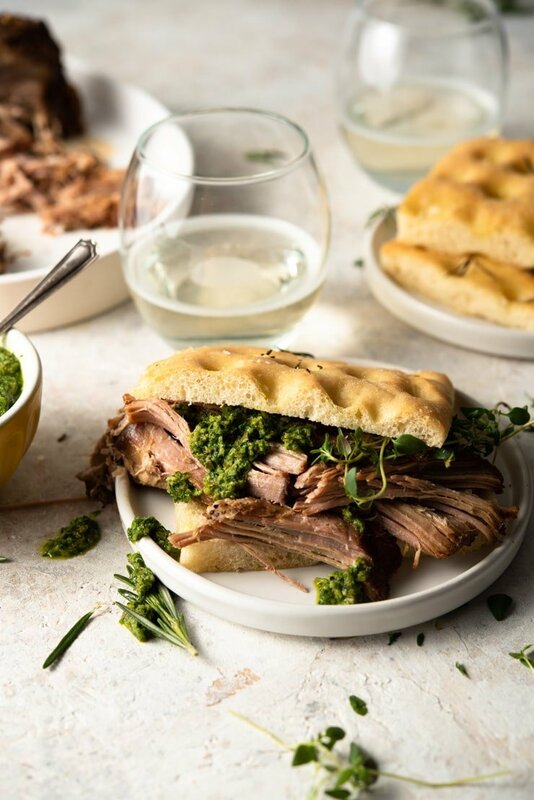 I love to serve this pulled pork on sandwiches made with homemade rosemary focaccia and salsa verde it's super simple but one of the best things you'll ever eat. Another great way to serve this is with roasted potatoes, grilled veggies or with a fresh salad. Don't skip the searing of the meat as it locks in a lot of flavour. If you don't want to use wine (although it gives the best flavour) you can use stock. I love your step-by-step shots! 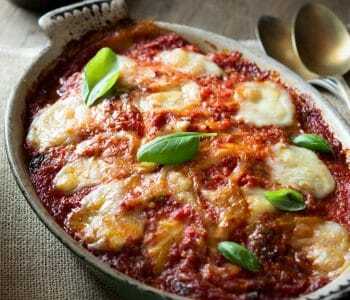 I am adding this to my must make dinner list to try very soon! Thanks so much Jessica so happy you find them helpful! This is such a flavorful pork shoulder. My family will love this. I love slow cooker recipe but what I love even more is slow cooker sandwich recipes! This looks so good, the perfect meal for busy nights. Thanks so much Sharon, I totally agree! I really can’t wait to try it again! Really delish! Thanks Toni, so happy you enjoyed it! We love pork in our house – can’t wait to make this one!! Thank you! Hope you love it, thanks so much Tawnie!